• Managing Plant Population in Cotton - Curtis Adams, Texas A&M AgriLife Research, April 2019. • Conference: MSU Row Crop Short Course, March 2019. • Conference: 66th Annual West Texas Agricultural Chemicals Institute Conference, December 2018. • Crop Rotations - Lessons Learned and Changing Times - M. Wayne Ebelhar, Mississippi State University, December 2018. • Cover Crop Management Considerations - Kip Balkcom, USDA-ARS, December 2018. • NRCS and Louisiana Cotton Sustainability Pilot Project - Rachel Holley Lee, Natural Resources Conservation Service, December 2018. • Achieving Healthy Soil in Low Rainfall Environments - Katie L. Lewis, Texas A&M AgriLife Research, Texas Tech University, December 2018. • The Importance of Soil Microorganisms to Keeping Soils Healthy - John Zak, Texas Tech University, December 2018. • Status Update on Fusarium Wilt of Cotton Race 4 in Texas and New Mexico - Thomas Isakeit, Texas A&M AgriLife Extension, December 2018. • Herbicide Resistance Status and Seedbank Persistence of Palmer amaranth (Amaranthus palmeri) and Waterhemp (A. tuberculatus) in Texas - Muthu Bagavathiannan & Peter Dotray, Texas A&M AgriLife Research, Texas Tech University, October 2018. • Cotton Module Electronic Numbering Standard - Edward (Ed) M. Barnes, Cotton Incorporated, October 2018. • Nutrient Management: Practical Considerations to Reduce Nutrient Loss - Michele L. Reba, USDA-Agricultural Research Service, October 2018. • Spray Carrier Rates and Nozzles Types Effect on Harvest Aid Efficacy - James A. Griffin, Texas A&M University, October 2018. • Making and Managing Cotton Replant Decisions - Shawn Butler, University of Tennessee, October 2018. • On Farm Irrigation Scheduling in Georgia: AgWET (Water Efficiency Team) - Wesley M. Porter, University of Georgia, August 2018. • Cross-Commodity Management of Silverleaf Whitefly in Georgia - Phillip Roberts, University of Georgia, August 2018. • Increasing the Water Use Efficiency of Irrigated and Dryland Cotton With Cover Crops - Tyson B. Raper, University of Tennessee, August 2018. • Saving Energy in Cotton Gins - Paul A. Funk, USDA-Agricultural Research Service, July 2018. • Soil Health in the Mid-South: First Step – Feeding the Soil Microbes - Bill Robertson, University of Arkansas, June 2018. • A Smartphone App for Scheduling Irrigation in Cotton - George Vellidis, University of Georgia, June 2018. • Benchmarking Sustainability Performance Utilizing the Fieldprint® Platform to Document and Demonstrate Continuous Improvement - Lexi Clark, Field to Market, May 2018. • Conference: MSU Row Crop Short Course, March 2018. • Use and Effectiveness of Nematicides to Manage Nematodes in Cotton - Travis R. Faske, University of Arkansas, February 2018. • Conference: 65th Annual West Texas Agricultural Chemicals Institute Conference, February 2018. • The Value of Rotations - Lessons Learned Corn-Cotton Rotations and the Mississippi Centennial Rotation - M. Wayne Ebelhar, Mississippi State University, January 2018. • Achieving Soil Health in Cotton Production Systems - Alan Franzluebbers, USDA-Agricultural Research Service, NC State University, December 2017. • Practical Approaches for Mitigating Insecticide Resistance - Dominic Reisig, NC State University, December 2017. • Integrated Management of Verticillium Wilt of Cotton - Jason E. Woodward, Texas A&M University, Texas Tech University, November 2017. • Drift Reduction Techniques - Greg R. Kruger, University of Nebraska-Lincoln, November 2017. • Contamination: Textile Mill Perspective - Vikki B. Martin, Cotton Incorporated, November 2017. • Plant Parasitic Nematodes Management Options in Cotton Production - Kathy S. Lawrence, Auburn University, September 2017. • Identification and Management of Foliar Diseases of Cotton in the United States - Heather M. Kelly, University of Tennessee, August 2017. • 2017 Stoneville Ginners School: RFID Technology, Tracking Modules, and Contamination, July 2017. • Herbicide-resistant Common Ragweed Management in Cotton - Charlie Cahoon, Virginia Tech, May 2017. • Tank Cleaning - Fred Whitford, Purdue University, May 2017. • Thrips Infestation Predictor for Cotton: An Online Tool for Informed Thrips Management - George G. Kennedy, North Carolina State University, April 2017. • Resistant Weeds: What You Should Know and Why You Should Care - Todd A. Baughman, Oklahoma State University, February 2017. • Management of Tarnished Plant Bugs in Cotton - Jeff Gore, Mississippi State University, January 2017. • Conference: 64th Annual West Texas Agricultural Chemicals Institute Conference, December 2016. 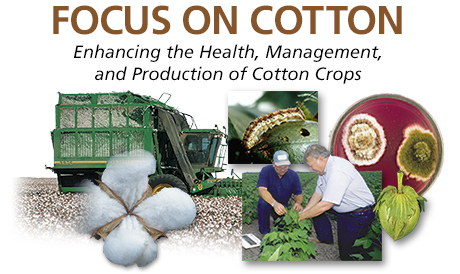 • What Does it Cost to Choose the Wrong Cotton Variety? - Guy D. Collins, North Carolina State University, December 2016. • Glyphosate-Resistant Johnsongrass Management - Daniel O. Stephenson, IV, Louisiana State University, December 2016. • Target Spot of Cotton - Six Years After First Report - Robert C. Kemerait, Jr., University of Georgia, November 2016. • Impact of Leaf Pubescence on Fiber Quality - Gaylon D. Morgan, Texas A&M University, October 2016. • Changing Bt Technologies and Bollworm Management in Bt Cotton - David Kerns, Louisiana State University, October 2016. • Zero Tolerance: Designed for Seedbank Reduction - Tom Barber, University of Arkansas, October 2016. • Utilizing Tissue and Petiole Sampling in Cotton Production - Hunter Frame, Virginia Tech, September 2016. • Mitigating Insect Management Effects on Pollinators - Scott D. Stewart, The University of Tennessee, August 2016. • ‘Cotton Physiology’ the Cornerstone of Future Cotton Science - Michael Bange, CSIRO Agriculture, August 2016. • Managing Cotton Fertility - Tyson B. Raper, University of Tennessee, June 2016. • Flag the Technology - Bob Scott, University of Arkansas, June 2016. • Beltwide Evaluation of the Effect of 2,4-D Drift on Cotton - Seth Byrd, Texas A&M University, May 2016. • Managing Thrips in Cotton: Research in the Southeast Region - Michael Toews, University of Georgia, May 2016. • Selection and Use of Sensors for Cotton Irrigation Management in Humid Regions - Brian G. Leib, The University of Tennessee, April 2016. • Capturing Value From Precision Agriculture Data: Big Data in Ag - Terry Griffin, Kansas State University, April 2016. • Overview of Cotton Incorporated’s Cotton Cultivated Website - Ryan Kurtz, Cotton Incorporated, April 2016. • Seminar: 2014 Crop Management Seminar webcasts, January 2015.